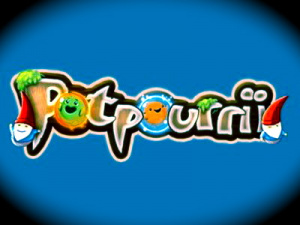 WiiWare World: In a nutshell what is Potpourrii all about? Ralph Egas: Potpourrii is about a forest, some leprechauns, a warlock with a desire for chaos and friendly spirits that are aligned specifically to the four seasons. In an old tree stump the leprechauns gather spirits and ‘retire’ them towards the tree every year to keep the magic tree in shape. The tree basically represents the life of the forest. This is just how things have been handled for ever since everyone can remember. Now every once in a while an evil warlock comes along and starts conjuring some evil magic effectively changing the order of time in a random fashion. As a result the spirits arrive in irregular order and the leprechauns have a hard time collecting and reordering. That’s basically where you come in. 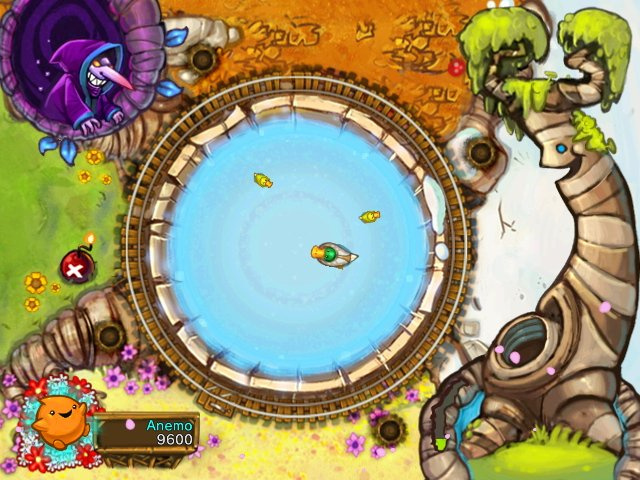 You use a cannon to pickup spirits and order them in the pool set in the tree stump before retiring the spirits properly. Your main goal is offering proper spirits in order to cure the tree. 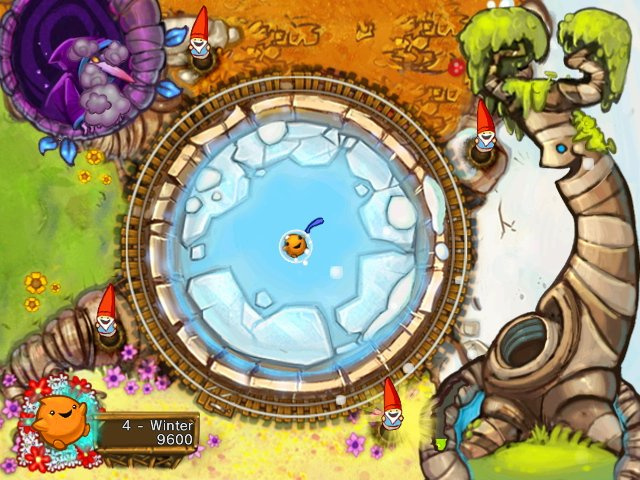 WW: How do the seasons represented in the game affect gameplay? RE: Spirits are basically shot at the Potpourrii and either stack or react with the spirits on it. The alignments of the spirits in play determine what will happen. Basically a successor season spirit will trigger a reaction. So, Winter will trigger Autumn, Spring will trigger, Winter, etc. Kind of like Rock-Paper-Scissors, but then with 4 instead of 3 elements. Of course this totally maps to the way seasons follow up on each other in a cyclic manner. Besides that you’ll always be playing during a season which will progressively influence things like the spawn rate of the spirits as well as the rotational velocity of the Potpourrii, temporarily that is. For instance, during Autumn there will be wind and of course this has some influence on the rotational speed of the Potpourrii. Getting better at the game will eventually expose more of these kinds of nuances during play. 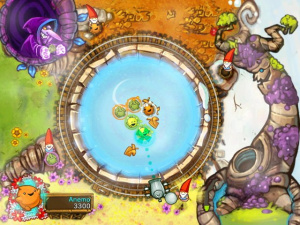 WW: What is the gameplay like in Potpourrii? It looks like Bust-A-Move with a circular board instead, is this the case? RE: Yes, I can imagine people think of Bust-A-Move when they look at the screenshots. But I think there’s a big difference. In Bust-A-Move you’ll be stacking various colours after which you’ll finish off by stacking 3 identically coloured elements. In Potpourrii you’ll be stacking identical spirits and finish off the stacks with a specific successor spirit. So it’s kind of the other way around. The idea of course is similar in that you’ll want to gather stacks as large as possible, because you’ll get rewarded in a non-linear fashion, not only scoring points but also making progress. Progress is made by ‘retiring’ a certain number of spirits towards the tree, effectively getting the tree healthy again. 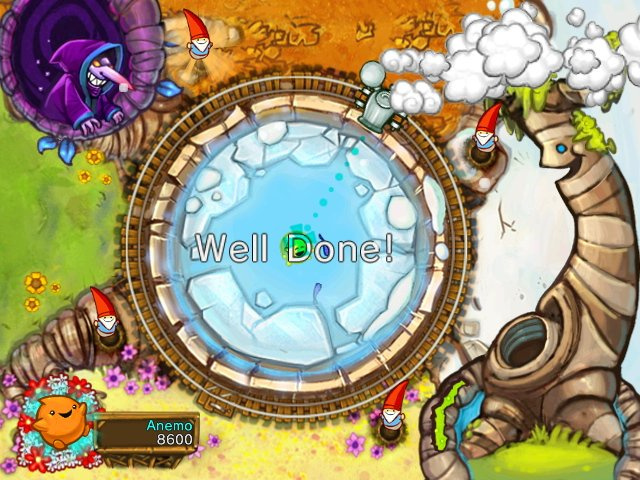 Also the fact that during building large stacks you’ll risk the chance of the Potpourrii getting stuck and eventually blown up resulting in a worker leprechaun getting dismissed, this of course shows a relationship with Bust-A-Move. And yet, Potpourrii feels very different and is actually simpler in terms of rules. Another difference is of course the circular board which I’m sure people will appreciate for its simplicity and intuitivism. There’s one cannon that can be anywhere and is positioned by the Wii Remote just like you would on a PC with a mouse but then even better! It’s even possible to hold the A-button and tweak the aim in any angle instead of just a set of discrete angles like in Bust-A-Move. 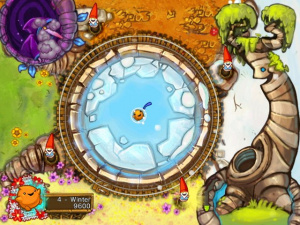 WW: Can you tell us more about the co-op mode in Potpourrii? RE: Yes of course! The co-op mode is just a second cannon and Wii Remote getting introduced. There’s no extra rules, no separate point distributions either. It’s as if one player is controlling two similar cannons independently but of course playing with two is more fun! This serves a purpose of course. For one, this will help parents help out their children playing the game just like Rare did in Viva Piñata for instance. Secondly, it is actually easier to play at higher levels with a friend, especially when using some strategy, like agreeing on covering specific seasonal areas in the play field. WW: What control schemes are offered in Potpourrii? RE: Just one, the simplest and basically the only one that we think is ever needed. You point the cross hair on the screen and the cannon will follow. You use just one button, the A-button, to both grab a spirit and release it. To increase the pace you’ll be able to use the B-button to instantly spawn a spirit. Of course the latter is optional and we anticipate advanced players will merely use it to speed up the early levels a bit. I can assure you that soon you won’t be needing the B-button any longer because the spawn rate will get insanely high! WW: How long has Potpourrii being in development? How many people have worked on it? RE: We started out in February and we recently submitted the lot to Nintendo, so I would say half a year. We’ve been working with just the two of us, Erik and me, designing, tweaking and programming the game. We worked on it during the evenings and weekends because we both still have other obligations besides Abstraction Games. Both the art work and music and sound were outsourced. I’m not sure about the exact numbers there but these are only marginally big in comparison. That I’m certain of. WW: Potpourri is normally thought of as a bowl of fragranced dried flowers in an old ladies bathroom. What was the rationale behind using this name with an added ‘i’? RE: Well, to be honest, it’s a bit far fetched, but still... The term ‘potpourri’ evolved into a mixture of sorts in plain English over the years. The Potpourrii is a mixture of seasonal spirits and therefore a mixture of some sort! Besides that there’s some poetic relationship between seasons and pleasantly smelling dried flowers. The extra added ‘i’ of course is a way to show our respect to the platform maintainer and a way to tie our title to this platform and we feel this title basically belongs to any Nintendo console and the Wii in particular because of the controls. WW: Can you tell us a bit about the history of Abstraction Games Studio? RE: Officially I started AG in September 2007 when I opened the company for business at the Chamber of Commerce in the Netherlands. In reality Erik and I have been working side to side for many years and December 2006 marked a starting point for formalising the idea of working together on our own projects. Initially we came up with an idea for XBLA, nearly finished it and it basically got rejected by Microsoft Casual Games. The title is called Qoobs and is a pure puzzle game with a great deal of polish waiting to be commercialised. We’ll have to see how to pursue this any further, perhaps on PC, or… Anyway, WiiWare was announced in the professional scene and that’s when we changed course, applied for the Wii Developer License Program and got on board. After that, in October 2007, we ordered development hardware, started cranking until a publisher came along picking up Qoobs. After a few months working on it and submitting the renewed title with help of the publisher it got rejected once again! Of course by then it was already February 2008 and we had postponed our work on the WiiWare platform in favour of the XBLA title that was already near completion. So, basically we had to design, program, take care of ratings, and outsource art, sound, localisation, etc. during the evening hours! Crazy! But, cool! We had seen our share of publisher processes in action, but doing it ourselves was quite something else. This has been a great adventure so far and things are prone to getting better even. WW: In addition to developing for WiiWare, you also have a XBLA game in development called Astronaut. How does developing for the two services differ? RE: I take it you got this information form our website which is terribly outdated, but will soon be updated. There is actually going to be a title called ‘Astronaut’ in development, but it’s not going to be targeted at XBLA, at least not initially. We’re actually in the middle of negotiations with our publisher so I’m sorry to inform you that I can’t get into much detail right now. About developing for XBLA I can’t tell you a lot either, but in general I know from experience as a contractor that developing for Xbox platforms is very nice indeed. The documentation is always great and structured and of course it’s nice to have a lot of horsepower for doing nice things. And yet, I think developing for Wii is more challenging, because of gameplay focus and because getting nice 3d graphics, AI and physics is more rewarding. Overall I think the Wii is a more ‘intimate’ platform, for both consumers as well as developers. I happen to like that! WW: Do you have any concerns over the limited internal memory on the Wii? RE: No. It’s worth noting that there are many nice games out of the Gameboy Advance for instance in much less memory, so why should anyone need more memory in their quest to cook up cool titles? Of course, with new technology comes the need for new memory specifications, but still, there’s a lot we can do on small memory machines. It just takes careful design and hardware appreciation. This is another example of the ‘intimate’ feel I was talking about. I could rant for hours on end about doing cool stuff on low-end machines and rewards involved, but let’s leave that for another time, shall we? WW: Does Potpourrii have any online gameplay or other special features we should know about? RE: No, I regret to inform you that we haven’t considered online play for this title. It was decided early on that for our first professional title we were going to draw the line in terms of technical abilities rather soon while trying to offer gameplay as intuitive and fun as possible instead. Features like online play and WiiConnect24 are very cool but involve many technical issues to cover which we thought was too much of a risk diminishing our quality standards for our initial title in a timely fashion. For our next title we definitely will and as a matter of fact we already a have a bunch of neat ideas in that area! 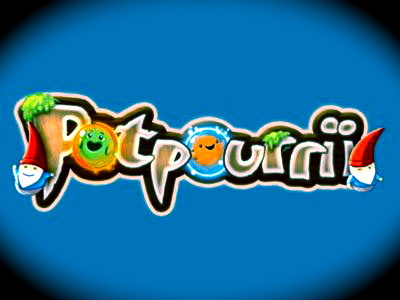 WW: When do you expect Potpourrii to be released on WiiWare roughly in Europe and North America? As a Dutch development studio which will come first? RE: Both versions have been submitted simultaneously, so it really depends whether our current version is going to be considered stable. If it is it will take probably a few more weeks from now, otherwise it could take another month after that. In any case there’s not going to be a delay between the two territories as far as we are concerned as both markets are interesting and I think it’s a great opportunity to show our game to a lot of people! WW: How many Wii points do you expect Potpourrii to retail for? RE: We’re currently thinking 800 points, but this has yet to be determined. WW: What other WiiWare game currently out has impressed you the most so far? RE: LostWinds for its visual style, control innovation and scale. 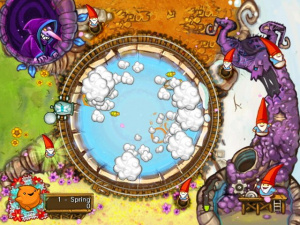 WW: Which other WiiWare game in development most intrigues you? RE: Strong Bad’s from Telltale Games. Yeah, what can I say? It’s an adventure game and I happen to like adventure games! I liked the Sam & Max series from Telltale, So I’m quite curious how this title will end up. WW: Do you have any other WiiWare developments planned after this or are you just testing the waters first? RE: Definitely! As we’re planning to hire a few people we’ll be working on two titles simultaneously, one being a WiiWare title. There are several options: one involving a helicopter and another being an adventure (puzzle solving) game that’s going to be 100% action free! You know, I’ve always wanted to make a real adventure game where you could explore and solve puzzles at your own pace. I think the genre hasn’t evolved that much ever since and we’re confident that our approach in combination with the possibilities the Wii platform is offering is going to rock! I love the title. Potpourrii. It looks like a mini-game that'd be in Okami. And rejected by Microsoft? Aww. WiiWare is like the comforting mother you run to when you've just been beaten up by a bully. I probably won't get it since I just got Magnetica Twist, but who knows? I am anxious to see indies do well though and am happy that they have other projects lines up after this one. wait a minute i was thinking of sony!...... my bad! That's pure hilarity right there. I'm not excited about this game, but I hope it sells well enough to make these guys full-time developers. The "part-time" thing kind of makes a game less appealing to me. Aw @ the Microsoft part. What a bully, that Microsoft. I really like the art and the few details scattered around. It looks like they've really put some thought into such small details, you know? I still haven't got a puzzle game (except Dr. Mario), so it seems like I'll give this game a try, after a review by you guys, of course. Microsoft being mean to you. It seems that many developers concentrate first on puzzle/fun games. And Potpourri is another one and maybe not even a bad one. But why so many? 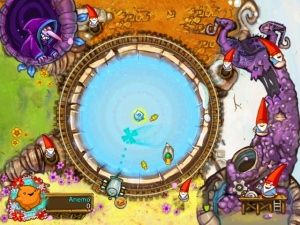 I believe the reason is, that puzzle games are the easiest to develop. And the developers gather experience by working on such titles and earn a few dollars/euros for their pocket money. But I dare to say, after the 99th Puzzle/Fun game, the time is now come to concentrate on genres that almost does not yet exist on Wiiware. To make a proposal: What about adventures like "Maniac Mansion" or "Zak McKracken"? I think the Wii console would be perfect for it.